CORSnet-NSW is a rapidly growing network of Global Navigation Satellite System (GNSS) Continuously Operating Reference Stations (CORS) providing fundamental positioning infrastructure for New South Wales. Currently consisting of over 60 permanent stations tracking multiple satellite constellations, CORSnet- NSW will expand to over 100 stations within the next two years. Airborne LiDAR surveys produce very accurate, high-resolution surface elevation models which are used for many surveying and civil engineering applications as well as for flood prevention and mitigation or monitoring coastal erosion and land subsidence. The key to producing high-quality elevation products is very precise geolocation and orientation of the LiDAR instrument during the survey, obtained with a combination of on-board GNSS and inertial sensors. 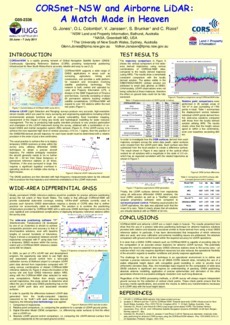 The usual practice is to deploy temporary GNSS reference stations in the survey area, utilising the short-baseline differential GNSS technique to obtain a precise aircraft trajectory. If the area surveyed is large, this generally means installing and operating receivers at many sites during a flight mission. 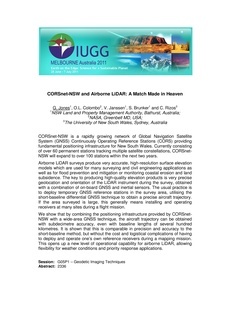 We show that by combining the positioning infrastructure provided by CORSnet- NSW with a wide-area GNSS technique, the aircraft trajectory can be obtained with subdecimetre accuracy, even with baseline lengths of several hundred kilometres. It is shown that this is comparable in precision and accuracy to the short-baseline method, but without the cost and logistical complications of having to deploy and operate one’s own reference receivers during a mapping mission. This opens up a new level of operational capability for airborne LiDAR, allowing flexibility for weather conditions and priority response applications.